Oral Histories is a showcase of interviews, performances, and articles by and about improvising musicians, artists, writers and scholars. This new monthly feature will offer an intimate look inside the minds and practices of some of the many dynamic, innovative people whose energy and ideas make improvisation studies such a vibrant field of inquiry. The Oral Histories project provides a space for improvising artists to be heard in their own words, often in dialogue with other improvisers, scholars and practitioners. Over the coming year, witness conversations with musicians including Dave Clark, Tanya Tagaq, William Parker and Amiri Baraka, writer Cecil Foster, and scholars from fields as diverse as legal studies and musicology. The conversations and performances of this diverse group, drawn from ICASP’s online Research Collection in Improvisation Studies, are sure to inspire and to enlighten. Read ICASP student Paul Watkins' reflective piece on the relationship between orality and improvised musical practices in our Research Collection, here. Inaugural Improviser-in-Residence program with Jane Bunnett was a great success! In January 2011, ICASP entered a new era of community interaction, research communication and musical dialogue with a yearlong collaboration, including a series of dynamic workshops, with its first Improviser-in-Residence, Jane Bunnett. 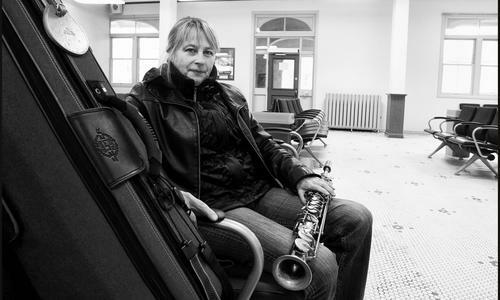 Jane Bunnett, a Toronto-based soprano saxophonist, flutist, and bandleader, is a multiple Juno Award winner, most recently honoured with an appointment to the Order of Canada. Bunnett is known for her creative veracity and her improvisational and courageous artistry. Performances as ICASP’s Improviser-in-Residence included music interventions held on February 11, 2011 at the University of Guelph Library, Red Brick Café, Bookshelf and the Downtown Guelph Public Library. These were unannounced and spontaneous jam sessions. Throughout the year Bunnett was involved in ICASP and the larger Guelph community through a series of public talks and performances, office hours, and innovative workshops for a variety of organizations: Guelph Youth Jazz Ensemble, Contemporary Music Ensemble, Homewood Health Centre, KidsAbility Centre for Child Development, Guelph-area high schools, Give Yourself Credit, and St. Joseph's Health Centre. Other performances with partner organizations were at the Boathouse and the Guelph Jazz Festival. A final year end celebration of Bunnett's residency took place on December 8th, 2011 at Van Gogh’s Ear. Her endeavors in community outreach and musical partnership were showcased in a performance with KidsAbility at the Guelph Jazz Festival on September 10th, 2011. All of Bunnett’s outreach activities during the year were video documented by Video Producer Dawn Matheson and soon you will be able to view these spectacular videos on the ICASP website. The videos not only show the importance of the program but also demonstrate the wonderful work that can be accomplished through collaborative partnerships between community organizations. We thank Jane Bunnett for her wonderful passion and service to ICASP and the larger Guelph community. Next month ICASP will introduce its next Improviser-in-Residence for the 2012 year! The Improviser-in-Residence program is a collaborative partnership with Musagetes. An interdisciplinary conference hosted by the Institute for the Public Life of Arts and Ideas, in collaboration with Improvisation, Community and Social Practice (SSHRC-MCRI), the Centre de recherche en éthique de l’Université de Montreal and the Département d’études anglaises, Université de Montréal. A preliminary conference program is now available. Conference sessions will take place at McGill University on April 12 and 14, and at the Université de Montréal on April 13th. · What does musical improvisation have to offer as a management model for corporations and not-for-profit organizations? · What is the relationship between improvisation and creativity in the global marketplace? · How might an improvised ethical framework translate in a for-profit corporate environment? · How can improvised praxis and ethics impact Corporate Social Responsibility projects? · In what ways are improvisatory ethics manifest in the emergent discourses and practices associated with social innovation? continuing to operate within an expansionist, capitalist economic framework? · What is at stake when large corporations adopt (or co-opt) musical practices—particularly those associated with subaltern communities? In light of the collaborative essence of musical creativity, a growing number of management theorists are looking to group musical improvisation as a model for corporate design. In the post-fordist, global marketplace, sudden change has become a quotidian part of the business experience. Just as a group of improvisers must negotiate sudden musical changes, unanticipated changes in the marketplace demand a similar kind of collaborative response. Faced with the unexpected, many businesses respond with collective flexibility. They establish a profoundly dialogical management structure, encouraging employees of all levels to engage in problem-solving. Akin to the musical knowledge-innovation dialectic, businesses walk the line between what Roger Martin calls reliability and validity, trusting in the knowledge and study that underlies their extant systems and models, while at the same time embracing the promise held by innovation, creativity, and surprise. Above all, they work to engage every individual in the group, giving every employee a sense of collective ownership over the challenges and the solutions. Critical academic essays are encouraged but the editors also welcome for consideration artist statements, commentaries, reviews, interviews and experimental textual forms. CSI/ÉCI encourages the submission of audio and visual content to accompany texts. It is the responsibility of the author to ascertain copyright and gain permissions. Please visit the criticalimprov website for more detials. Critical Studies in Improvisation/Études critiques en improvisation is an open-access, peer-reviewed, electronic, academic journal on improvisation, community, and social practice housed at the University of Guelph. The editorial and advisory boards are made up of leading international scholars spanning diverse disciplines. CSI/ÉCI publishes twice a year, in May and December. The journal publishes scholarly essays by artists, activists, and intellectuals, as well as reviews of books, performances, and films. Bebop was about change, about evolution. It wasn't about standing still and becoming safe. If anybody wants to keep creating they have to be about change. 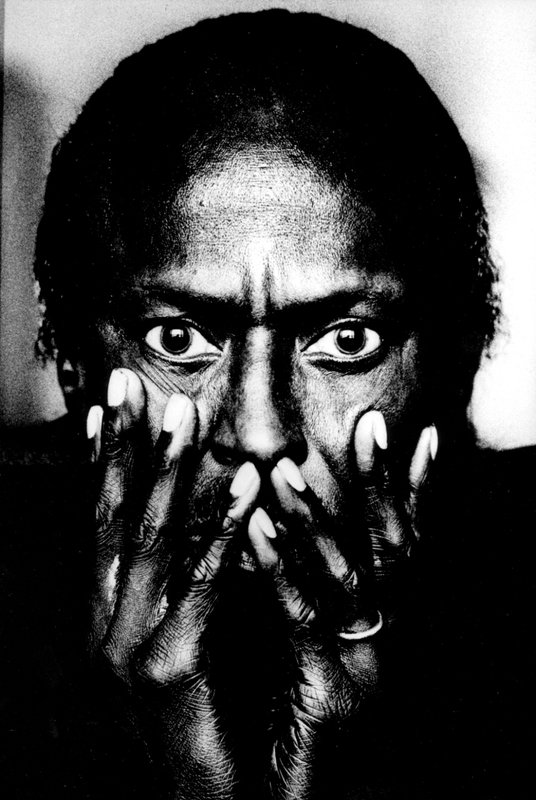 Miles Davis was an American jazz musician, trumpeter, bandleader, and composer. Widely considered one of the most influential musicians of the 20th century, Miles Davis was, with his musical groups, at the forefront of several major developments in jazz music, including Bebop, cool jazz, hard bop, modal jazz, and jazz fusion. The international Improvisation, Community, and Social Practice research project explores musical improvisation as a model for social change. The project plays a leading role in defining a new field of interdisciplinary research to shape political, cultural, and ethical dialogue and action. As a form of musical practice, improvisation embodies real-time creative decision-making, risk-taking, and collaboration. Improvisation must be considered not simply as a musical form, but as a complex social phenomenon that mediates transcultural inter-artistic exchanges that produce new conceptions of identity, community, history, and the body. This project focuses primarily on jazz and creative improvised music. The dominant theoretical issues emerging from this music have vital social implications. Check out our diverse research collection. "Through Pauline Oliveros and Deep Listening I finally know what harmony is... It's about the pleasure of making music." Pauline Oliveros, composer, performer and humanitarian, is an important pioneer in American Music. Acclaimed internationally, for four decades she has explored sound—forging new ground for herself and others. Through improvisation, electronic music, ritual, teaching and meditation she has created a body of work with such breadth of vision that it profoundly affects those who experience it and eludes many who try to write about it. Oliveros has been honored with awards, grants and concerts internationally. Whether performing at the John F. Kennedy Center in Washington D.C., in an underground cavern, or in the studios of West German Radio, Oliveros’ commitment to interaction with the moment is unchanged. Through Deep Listening Pieces and earlier Sonic Meditations, Oliveros introduced the concept of incorporating all environmental sounds into musical performance. To make a pleasurable experience of this requires focused concentration, skilled musicianship and strong improvisational skills, which are the hallmarks of Oliveros’ form. In performance Oliveros often uses an accordion which has been re-tuned in addition to electronics to alter the sound of the accordion and to explore the individual characteristics of each room. Oliveros has built a loyal following through her concerts, recordings, publications and musical compositions that she has written for soloists and ensembles in music, dance, theater and interarts companies. She has also provided leadership within the music community from her early years as the first Director of the Center for Contemporary Music (formerly the Tape Music Center at Mills), director of the Center for Music Experiment during her 14 year tenure as professor of music at the University of California at San Diego to acting in an advisory capacity for organizations such as The National Endowment for the Arts, The New York State Council for the Arts, and many private foundations. She now serves as Distinguished Research Professor of Music at Rensselaer Polytechnic Institute and Darius Milhaud Composer in Residence at Mills College. Oliveros has been vocal about representing the needs of individual artists, about the need for diversity and experimentation in the arts, and about promoting good will. Click here to listen to Horse Sings From Cloud from her 1983 Work, The Wanderer. Click here to watch a PLENARY PANEL featuring Pauline Oliveros on Music and Improvisation Software: an interface for people with disabilities. 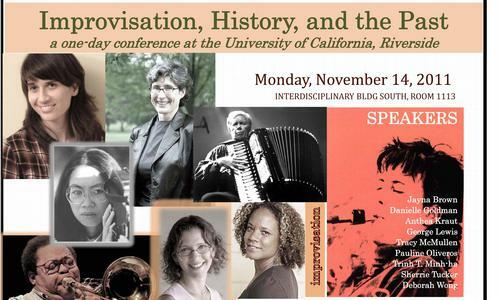 On Monday, November 14, 2011 nine invited scholars from a variety of disciplines gathered together to present on and discuss improvisation and its relationship to history and the past. This day-long conference featured keynote lectures by Danielle Goldman (Assistant Professor of Dance at the New School and author of I Want to Be Ready: Improvised Dance as a Practice of Freedom), eminent scholar and filmmaker Trinh T. Minh-ha (UC Berkeley); and scholar, composer, improviser, and MacArthur Fellow George Lewis (Columbia University). The conference was capped with a performance of improvised music by renowned improviser and composer Pauline Oliveros (digitally enhanced accordion) with Tracy McMullen on saxophone. The papers covered a wide variety of topics dealing with improvisation, the past, history, memory, and political action. McMullen opened the conference by suggesting the need to distinguish between “the past” and “history” and their consequent relationship to improvisation, habit, and narrative. Oliveros played a recording of an improvisation between herself, Terry Riley, and Loren Rush recorded in 1957. As far as she knows, this was the first recording of a completely free improvisation in the genre of Western Art Music. In examining memories of the Hollywood Canteen during WWII, Sherrie Tucker thought about memory itself as a form improvisation. In a further investigation of memory practices, Goldman’s keynote investigated Ishmael Houston-Jones’s 2010 re-performance of THEM (1986)—his dance piece in response to the AIDS crisis in the gay community—and the ramifications of re-performing such a historically situated, live work in a new era and with aging (and newly added young) bodies. Trinh spoke of the improvisatory aspects of the Tibetan struggle for independence. While China seems bent on portraying the struggle as one headed by the Dalai Lama (a claim accepted as specious by the international community), Trinh points out that the acts are generally contingent, spontaneous, and without a central leadership. This idea of protest as improvisatory returned later in the day as discussion turned toward the improvisatory aspects of the Occupy Wall Street movement. The Occupy movement has been criticized as leaderless and diffuse in its aims. For many, however, this is the precise strength of the movement and may point to how improvisation is a better hermeneutic for understanding how protest operates today. Further, Deborah Wong’s discussion of how police improvise elicited more discussion on the importance of reacting to specific circumstances rather than following procedure that may have lethal consequences. Participants and attendees were grateful for the intellectual and personal connections made. This conference helped to further the investigation into how improvisation offers a useful hermeneutic for understanding many of our present actions (be they political, corporeal, artistic, or conceptual) in relation to our past and future. According to one of the definitions of experimental music formulated by John Cage, the role of experimentation is to ask questions rather than to provide canned answers. This issue of TACET seeks to turn this saying back on experimentation itself, by examining its principles, manifestations and challenges, both historical (provided they question our contemporaneity) and current. Where is experimentation to be found, therefore, within the diversity of experimental music? When is there experimentation? What are the processes used? What may be the differences and the tensions between the multiple uses of the term, which also vary according to the cultures and the socio-historical contexts? What are the forms of sound experimentation today? What movements can be observed, from one generation to the next, in the musical problems, but also the social and political problems that experimentation poses? This issue of TACET seeks to address these questions from an interdisciplinary perspective (aesthetics, philosophy, musicology, cultural history, cultural studies, gender studies, sociology, political science, literature, psychoanalysis etc.) and it aims to bring together an ensemble of studies in which experimentation will be examined in the diversity of its forms and the heterogeneity of its problems. We await general analyses, special cases and cross-disciplinary studies. The questions proposed in this call for papers are not exhaustive. They represent a few suggested general avenues of research for potential contributors. They do, nevertheless, seek to serve as a reminder that the TACET review expects in-depth studies with a well-argued subject. The Editorial Board will, in addition, pay particular attention to the editorial quality of contributions, considering that literary and poetic dimensions all have their place in the articulation and transmission of a thought. Authors are equally reminded that the journal is aimed at a broadened readership. Attached to the article should be an abstract, a few key-words and a brief biography of the author. We ask authors to follow the instructions (article format, bibliographic standards) available at the call for papers on the website. A related theme is the myth of artistic authenticity that lives on within the jazz tradition. These can include the notion that a musician must have lived “life’s downsides” in order to have something genuine to share through one’s music, or that a musician must find one’s “own tone”, in a broad sense, a tone which is closely associated with a musicians identity. Can one actually hear that in the music? What about race and nationality? Can jazz from the Nordic countries be authentic? Want to read past newsetters, or refer a friend to the monthly newsletter, then please do!